The “Teach Me Time” talking alarm clock is the perfect invention for young children who are learning to tell the time, as well as their parents who can help to reinforce bedtime and getting-up-time rules. The clock has both analogue and digital clocks, so a child learns to tell the time in two different ways at the same time. There’s also a Teach Me Time game which puts a random time on the analogue clock and asks the child to say what time it is. 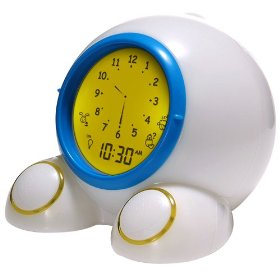 The alarm clock also features a dual-coloured night-light which glows green when it’s “OK to wake” and glows a soft yellow colour throughout bedtime. Available in three different colours for £39.99.